Does your investment portfolio meet your financial expectations? If not, then you may want to explore your alternative options. Find out why other investors, whose past portfolios consisted of CD’s, mortgage pools, corporate bonds, etc., are turning their attention to Real Estate secured First Trust Deed Investments. Download this FREE whitepaper to educate yourself on why you may want to consider adding them to your investment portfolio. 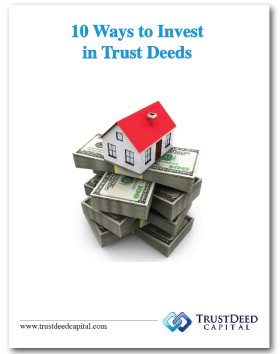 Start by seeing for yourself how First Trust Deed Note Investments can help you achieve your financial goals.